, an eminent English poet, the only son of sir John Denham, knt. of Little Horseley in Essex, by Eleanor, daughter of sir Garret More, knt. baron of Mellefont in Ireland, was born at Dublin in 1615, his father having been some time before chief baron of the exchequer in Ireland, and one of the lords commissioners of that kingdom; but, upon his being made, in 1617, one of the barons of the exchequer in England, he was brought by him to London, and educated there in school-learning. 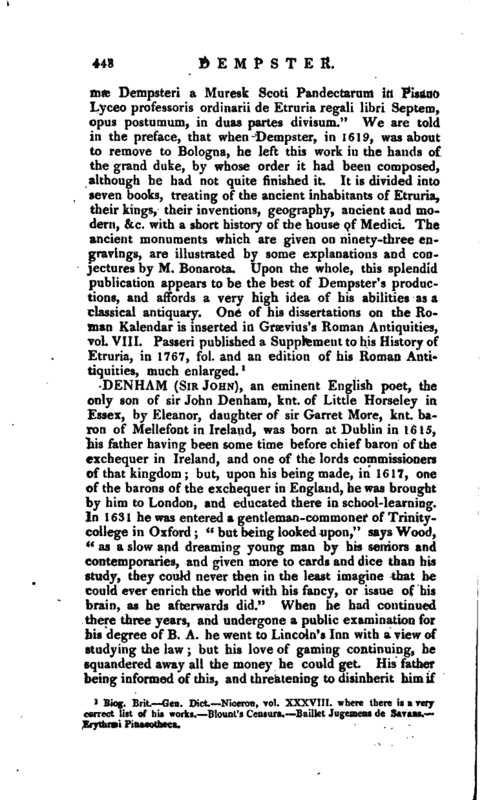 In 1631 he was entered a gentleman-commoner of Trinitycollege in Oxford “but being looked upon,” says Wood, “as a slow and dreaming young man by his seniors and contemporaries, and given more to cards and dice than his study, they could never then in the least imagine that he could ever enrich the world with his fancy, or issue of his brain, as he afterwards did.” When he had continued there three years, and undergone a public examination for his degree of B. A. he went to Lincoln’s Inn with a view of studying the law; but his love of gaming continuing, he squandered away all the money he could get. His father being informed of this, and threatening to disinherit him if | he did not reform, he wrote a little “Essay upon Gaming,” which he presented to his father, in order to shew him what an abhorrence he had conceived towards it: this gentleman’s death, however, no sooner happened, in 1638, than he returned to his former habits, and presently lost several thousand pounds. That nothing sold better, except ‘twere his lands. Was writ by a vicar, who had forty pounds for ’t. In 1647 he was entrusted by the queen with a message to the king, who was then in the hands of the army, and to whom he got admittance by the help of his acquaintance Hugh Peters; “which trust,” says he, in the dedication of his poems to Charles II. “I performed with great safety to the persons with whom we corresponded: but about nine months after, being discovered by their knowledge of Mr. Cowley’s hand, 1 happily escaped both for myself and them.” In April 1648 he conveyed away James duke of York into France, as Wood says; but Clarendon assures us, that the duke went off with colonel Bamfield only, who contrived the means of escape. Not long after, he was sent | sent ambassador from Charles II. to the king of Poland; and William (afterwards lord) Crofts was joined in the embassy with him. Among his poems is one entitled, “On my lord Crofts’s and my journey into Poland, from whence we brought 10,000l. for his majesty, by the decimation (or tithing) of his Scottish subjects there.” About 1652 he returned to England; and, his paternal estate being greatly reduced by gaming and the civil wars, he was kindly entertained by lord Pembroke at Wilton; where, and sometimes at London, he continued with that nobleman above a year. At the restoration he entered upon the office of surveyor-general of all his majesty’s buildings; and at the coronation of the king, was created K. B. Wood pretends, that Charles I. had granted our poet the reversion of that place, after the decease of the famous Inigo Jones, who held it; but sir John himself, in the dedication of his poems, assures us, that Charles II. at his departure from St. Germain’s to Jersey, was pleased, freely, without his asking, to confer it upon him. After his promotion to tbis office, he gave over his poetical lines, and “made it his business,” he says, “to draw such others as might be more serviceable to his majesty, and, he hoped, more lasting.” Uponsome discontent arising from a second marriage, he had the misfortune to be deprived of his reason. 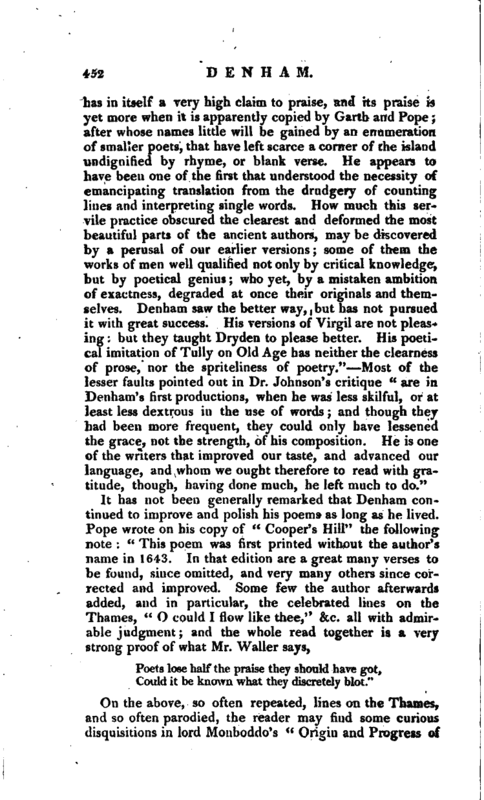 Dr. Johnson notices a slight circumstance omitted by other writers, which is, that when our poet was thus afflicted, Butler lampooned him for his lunacy. 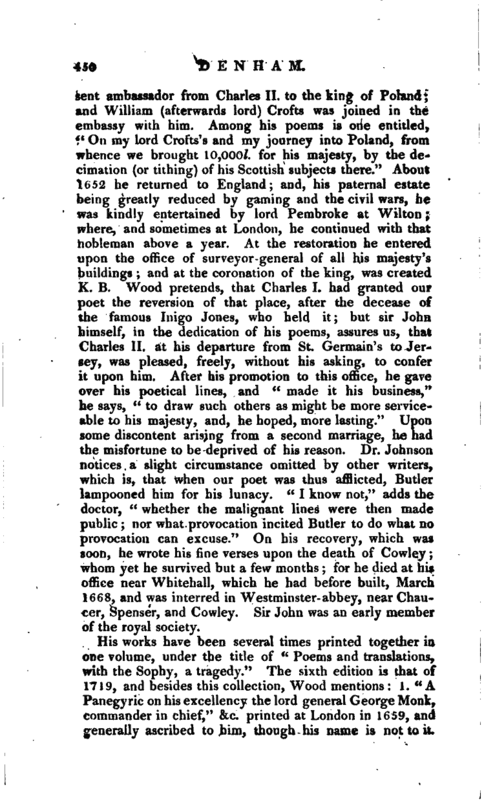 “I know not,” adds the doctor, “whether the malignant lines were then made public; nor what provocation incited Butler to do what no provocation can excuse.” On his recovery, which was soon, he wrote his fine verses upon the death of Cowley; whom yet he survived but a few months; for he died at his office near Whitehall, which he had before built, March 1668, and was interred in Westminster-abbey, near Chaucer, Spenser, and Cowley. Sir John was an early member of the royal society. 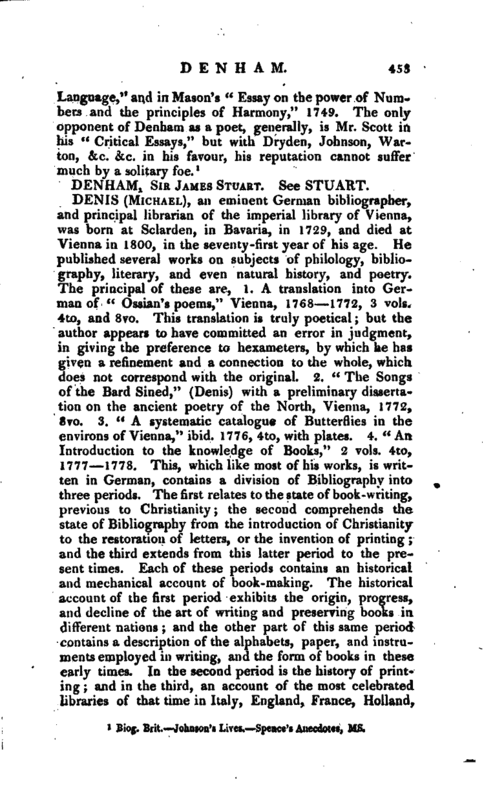 His works have been several times printed together in one volume, under the title of “Poems and translations, with the Sophy, a tragedy.” The sixth edition is that of 1719, and besides this collection, Wood mentions: 1. “A Panegyric on his excellency the lord general George Monk, commander in chief,” &c. printed at London in 1659, and generally ascribed to him, though his name is not to it, | S. “A New Version t>f the Book of Psalms.” 3. 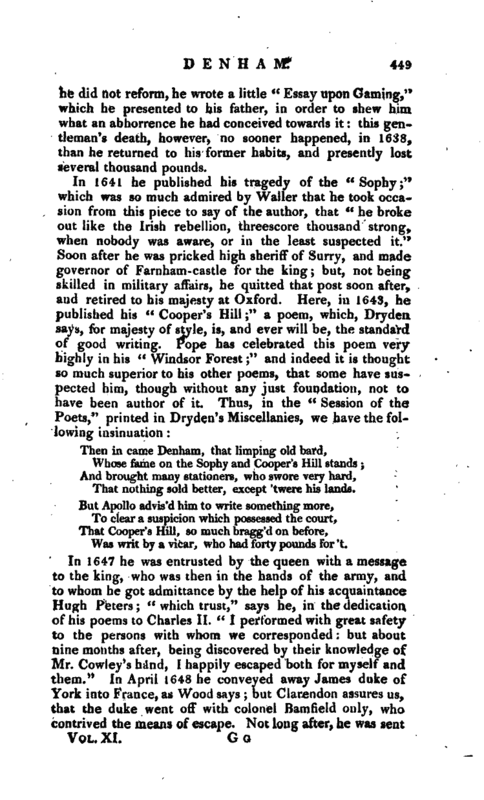 A prologue to his Majesty at the first play presented at the Cockpit in Whitehall, being part of that noble entertainment which their majestes received on November 20, 16-0, from his grace the duke of Albemarle. 4. “The True Presbyterian without disguise: or, a character of a Presbyterian’s ways and actions,” Lond. 1680. Our author’s name is to tiiis poem; but it was then questioned by many, whether he was the author of it. In 1666 there were printed by stealth, in 8vo, certain poems, entitled “Directions to a Painter,” in four copies or parts, each dedicated to Charles II. They were very satirically written against several persons engaged in the Dutch war in 1665. 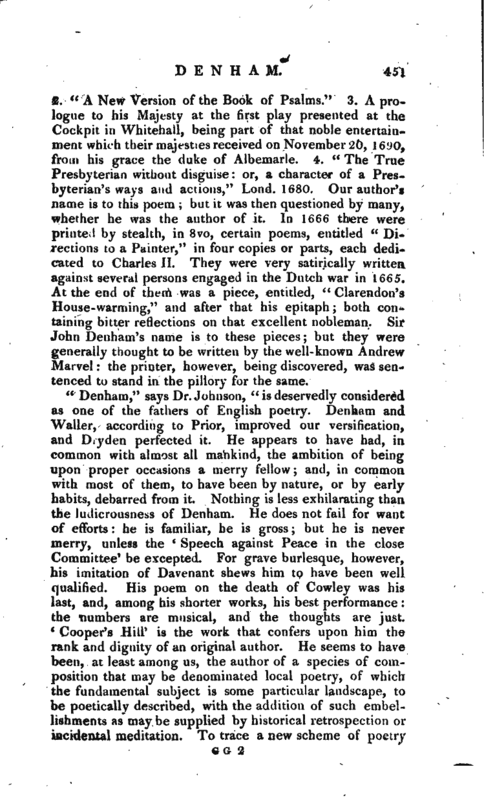 At the end of them was a piece, entitled, “Clarendon’s House-warming,” and after that his epitaph; both containing bitter reflections on that excellent nobleman. Sir John Denham’s name is to these pieces; but they were generally thought to be written by the well-known Andrew Marvel: the printer, however, being discovered, was sentenced to stand in the pillory for the same. Could it be known what they discretely blot."